Looking further afar, Inverness is only about 180 km north of Glasgow as the crow flies, or about 270 km by road, yet the fastest train is underway for almost 3½ hours. In an ideal world, I’d shut down Glasgow and Edinburgh airports and build a new one south of Falkirk (the exact location would of course have to depend on the topology). 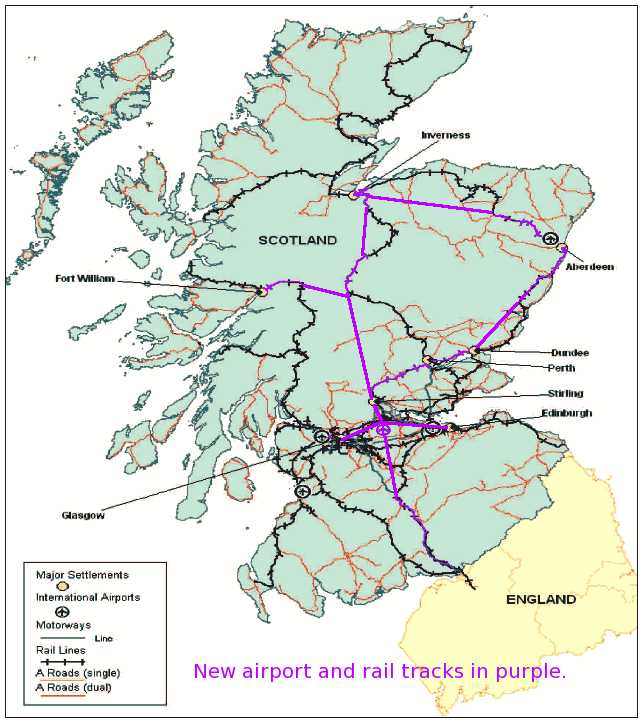 I’d then build some very straight rail tracks from Glasgow via the new airport to Edinburgh, so that the trains could achieve a decent speed (I’m imagining something like 15 minutes from either city centre to the airport, or about 30 minutes from Glasgow to Edinburgh). 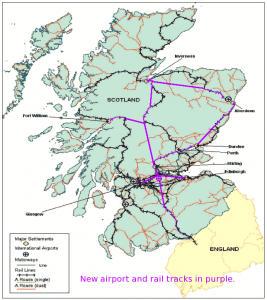 So the dream of Cumbernauld International Airport is still alive, then …? Isn’t Cumbernauld too far to the west? Even if Cumbernauld would have been this right place 20 years ago, I think the airport has to be located further east post-devolution.